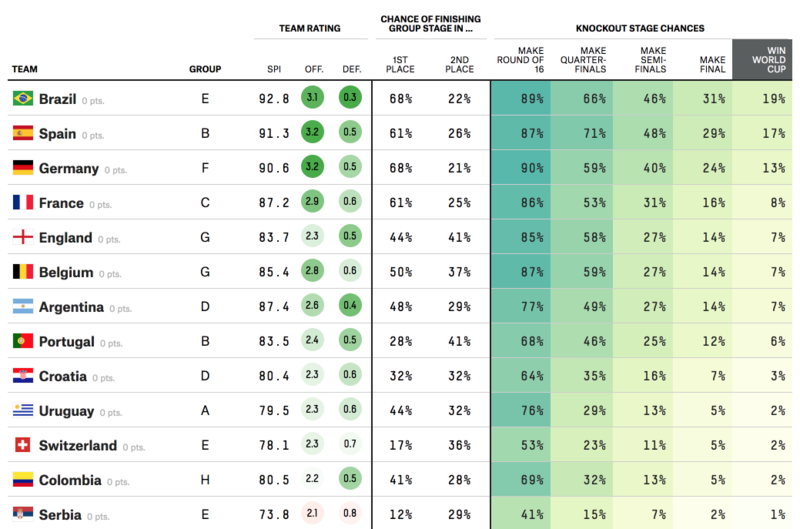 Brazil is the FiveThirtyEight favorite — again. When the 2018 World Cup begins play today, it’ll kick off what could be a very good month for the usual suspects of international soccer. Our World Cup probability model, which launched on Wednesday (read more about it here), gives Brazil — the most successful team in World Cup history — the best chance of winning the tournament, at 19 percent. Spain (the winner two World Cups ago1) and Germany (the defending champ) aren’t very far behind. And don’t forget about the classic contenders France and Argentina, who are also in our model’s top seven. It’s not all historic honchos that have risen to the top of our model. Group G standout Belgium, which has enjoyed a meteoric rise in the worldwide rankings over the past decade, has a 27 percent chance of making the semifinals for just the second time in team history (and the first since 1986). This could very well be the year for fellow Group G side England — which fancies itself a blue blood2 but won its sole World Cup more than 50 years ago — to finally end its drought. Over in Group B, Portugal has a good chance to avenge the disappointment of 2014 and advance deep into the tournament — provided it can stave off Morocco (and, as always, that Cristiano Ronaldo can carry over his club-team form to the global stage). In Group D, the veteran Croatians are not only a good pick to advance to the knockout stage but maybe even to make some noise once there. And as the front-runners in Group H, James Rodríguez and Colombia may be poised to advance past the quarterfinals for the very first time in national history. Further down the list, our model sees a few dark-horse candidates to keep tabs on. If healthy, Mohamed Salah and Egypt have a much better knockout-stage probability than their Soccer Power Index would imply, because they were fortunate to draw the historic cupcake that is Group A. (Speaking of which: Uruguay — a two-time World Cup winner, so they might not quite fit the dark-horse image — and the host country, Russia, also have great odds of getting to the round of 16 out of the same group.) In Group H, meanwhile, Poland boasts essentially a coin flip’s chance to advance to the knockouts — which would be a first since 1986 — as does Denmark in Group C, Switzerland in Group E and Sweden in Group F.
To get there, though, all of these hopeful sides must win (or at least draw) a series of harrowing matchups within their respective groups. Thanks to our model, we can identify the matches that will likely swing the tournament’s odds the most, much like we did for college football’s most crucial games last fall. And perhaps surprisingly, no group-stage match will shape the World Cup more than Morocco’s duel with Spain on June 25. Because Hakim Ziyech and the talented Moroccans were cruelly slotted into one of the tournament’s deadliest groups (Group B), we give them only a 28 percent chance of making the round of 16. But Morocco is strong enough to potentially play spoiler to the group’s favorites — Spain and Portugal — which also means that if Morocco wins or draws in the group stage, it could have ripple effects for teams across the tournament. Aside from the few group-stage clashes between titans, such as Spain-Portugal or England-Belgium, there’s a common recipe for the crucial matches listed above: a talented underdog that can’t be overlooked by its contending opponent and that has the potential to break the knockout bracket before it’s even set. But don’t just take my word for it — in our interactive, you can actually tinker with the effect of a given team finishing in a given slot and see how it changes the overall odds. So with all that said, all that’s left is to enjoy the action on the pitch. Check our model for the latest odds and live, in-game match probabilities, and we’ll be with you throughout the tournament with updates and analysis. Never mind the whole firing-the-coach-on-the-eve-of-the-Cup thing. In fairness, it did basically invent modern soccer.